Silver and Rhinestone Circles Necklace on silver tone 16 inch adjustable chain. 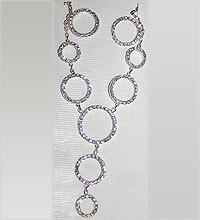 Chain is silver tone with silver and rhinestone circles. Lobster closure.